Many of the .arc files in langEN contain unused graphics. 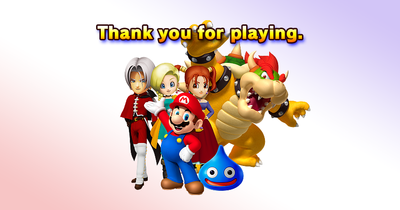 thanks_EN.arc contains a leftover thank you message from E3. game_sequence_result_EN.arc contains a dummy Mii face. game_title_EN.arc contains what seems to be an early version of the title screen. It has a temporary logo, reading "Itadaki Street Wii (temporary)", "いただき ストリート Wii (仮)", a different background, and a rather more polite "Press 2" message. 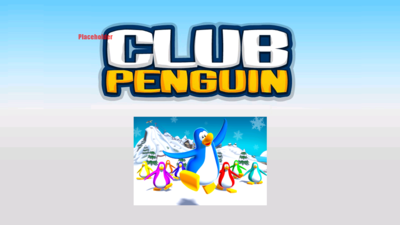 title.cmparc contains a placeholder title texture from Club Penguin: Game Day!. The entire file was accidently copied over by the developers when they were copying over the files used for the "Please wear the Wiimote Wrist Strap" screen from Game Day, which they had access to due to Artoon having been absorbed into Marvelous AQL. 30 of the 78 boards in the board layout folder, /param/, go unused. Many of them aren't even referenced by the game at all, though a few are (and thus can be accessed without swapping files around). 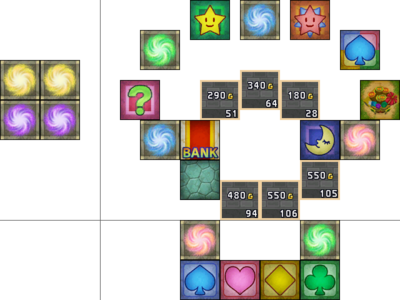 Most easy mode boards are identical to their standard mode counterparts. The few that aren't will be included along with the standard boards. Most likely used to test out the Arcade/Casino games. The properties are included solely to prevent the game from crashing, as they are unreachable without making a line of warps on Round the Blocks. This board is referenced internally; starting a game on board 45 will load this board with Dragon Quest-themed tiles and Alefgard's music. 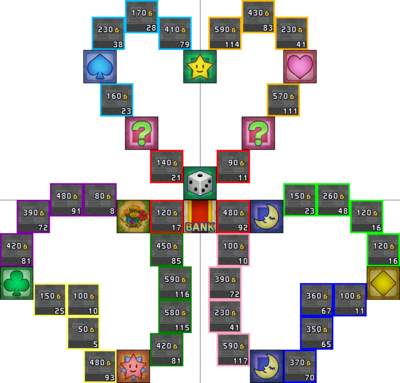 The easy rules board is completely different, consisting of a small "H" shape made out of properties and suits. 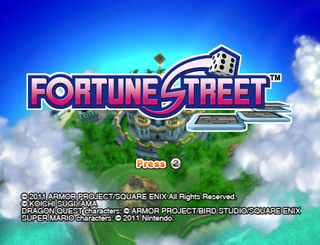 If this isn't the smallest playable Fortune Street board, it's damn near close to it. The AI does not like this map and will softlock the game trying to move. With four human players, it works fine (though the low starting cash makes it incredibly difficult to play). This board is referenced internally twice - board 43 will load this board with Mario-themed tiles and the Main Menu's music, while board 46 will load the board with Dragon Quest-themed tiles and Alefgard's music. A debug map for testing out every single square at the same time. 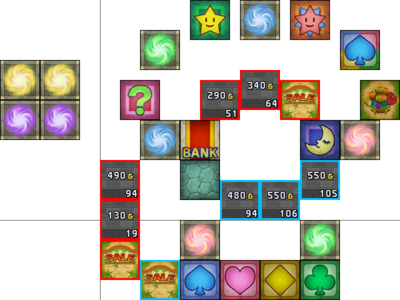 The unconnected warps off to the left side are unreachable, but the tiles above the Bank that aren't connected can be moved between. As with the previous board, this board is referenced internally twice - board 44 will load this board with Mario-themed tiles and the Main Menu's music, while board 47 will load the board with Dragon Quest-themed tiles and Alefgard's music. Nearly identical to the previous board, the only differences being the lack of the extra branch that contained two vacant lots and the one vacant lot in the middle of the board is a standard property here. As the name would lead you to assume, this is indeed Street 1 from Itadaki Street 2. The property values do not match that game's prices, however, nor are the districts exactly the same. 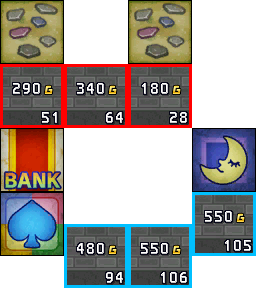 The maximum dice roll is 5, which matches the maximum dice roll this board has in Itadaki Street 2. It's still notable, however, because none of the boards in this game use a maximum roll that low. Continuing the trend, this is Street 2 from Itadaki Street 2. Once again, the property values do not match. 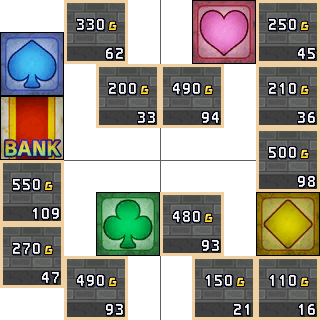 Weirder than that, though, is the complete lack of Suit squares on the board - they've all morphed into Venture squares. 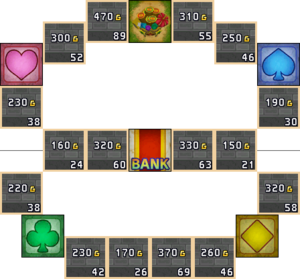 If you're not familiar with how this board works in Itadaki Street 2, going up the top or bottom path (through the Arcade or Boon squares) requires you to go past the Bank and continue going through the sides. This behavior is replicated in this board's waypoint system. As expected, this is Street 3 from Itadaki Street 2. Yet again, the property values don't match. Standard rules 2-07-hidari is Peach's Castle, but easy rules Peach's Castle uses o_peach instead; this is the only naming discrepancy among all of the boards used in the game. Easy rules 2-07-hidari is, as you would expect. just like the standard rules version except shrunken a bit. 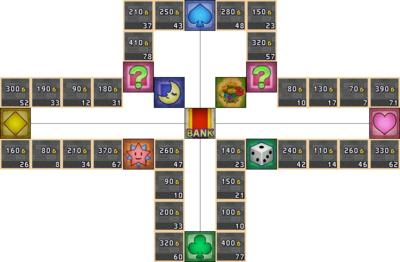 An early version of Alefgard, with shop values that doesn't match Street 15 of Itadaki Street 2 or the Fortune Street Alefgard board. 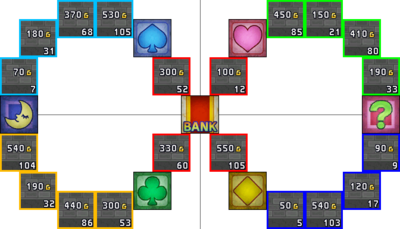 Even stranger, where the Stockbroker normally is in Alefgard lies a square with a type that is completely undefined; it shows up as a blank square that does nothing in-game. Additionally, the Club is 32 units further to the left and the districts are laid out completely differently. I hope you like vacant lots because that's all you'll be getting here. The easy rules version of this map is identical; this is worth mentioning because it's still 100% vacant lots even in a rule set which doesn't normally allow for them. This board is referenced internally; board 43 will load this board with Mario-themed tiles and the Main Menu's music. A board so unique, it has an entire board option reserved just for it (that's buggy and barely works, but that's just a minor detail)! 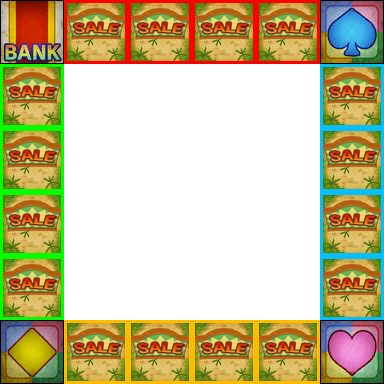 The board loops both left and right; all directions end up going through the Take-A-Break square on the left. 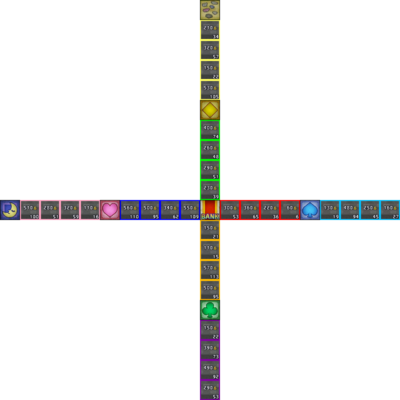 Unfortunately, the board is too large for the looping behavior that was made just for it - the tiles on the bottom wrap over themselves, causing a mess of shops on top of other shops/the Take-A-Break square and a bunch of Z-fighting. If the board is shrunk down (two tiles cut off from each edge), the tiles fit together perfectly. What's more, the way the tiles are spaced fits the Starship Mario board almost perfectly; it's reasonable to assume that this board was the original idea for it. On the subject of the special looping mechanism this board uses: it's clearly not finished. While going around left and right, the camera will do a 180-degree flip halfway down instead of tilting with the player. 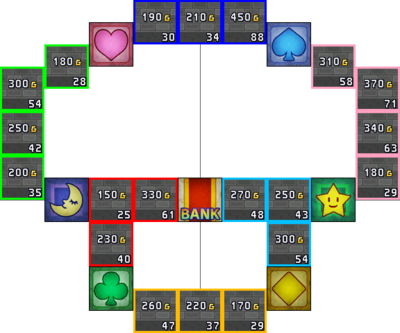 The cursor in free-look mode does not tilt at all, and it is completely impossible to select the squares on the sides of the board. 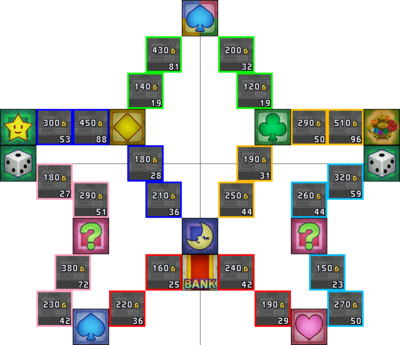 This board is similar layout-wise to the Practice Board used in Tutorial mode, but the right loop is bigger and has the Arcade and Take-A-Break squares next to each other. Also, the top and bottom are separate districts whereas, in the Practice Board, the left and right halves are instead. 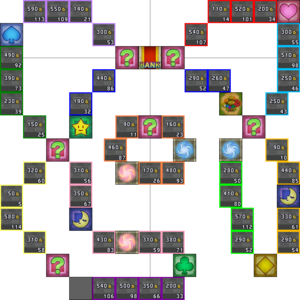 This board is referenced internally; board 18 will take you to this board with the typical Tutorial background, name, and music. This is so close to easy rules' Castle Trodain! 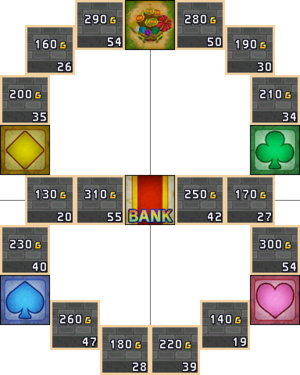 The only difference is that the three properties to the left of the Bank have slightly different shop prices. This board is referenced internally; board 39 will take you to this board with the typical Tutorial background, name, and music. A simple mushroom-shaped map. Nothing too special about it, although it is referenced internally: board 19 will take you to this board with the typical Tutorial background, name, and music. A cool star-shaped map with many branches. This map appeared in Dragon Quest & Final Fantasy in Itadaki Street Portable, where it was the Library of the Ancients map. 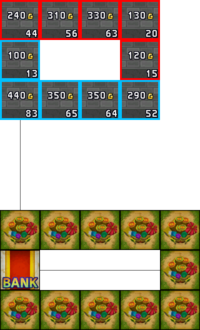 All of the shop values are identical between this map and the Itadaki Street Portable version, though the shop prices and target value were changed slightly. The only unused map to feature switches! They would move the train car back and forth between the cars on the edges, trapping any player unlucky enough to be on the wrong edge (until they warped to the other car, at least). This board was used in a previous game in the series, Dragon Quest & Final Fantasy in Itadaki Street Portable. This (surprise!) is the board that was used for the E3 demo. 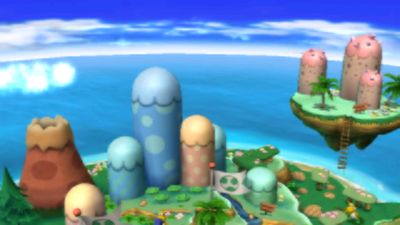 While the name would imply that it's for the Dragon Quest Ghost Ship, it was instead featured on Bowser's Castle. 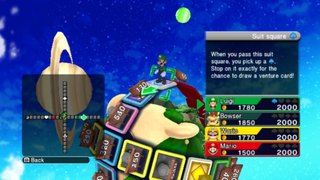 Loading board 40 in-game will lead you to this board, complete with Bowser's Castle backdrop, name, and music. Found in the files for the Slime Race minigame, there is an unused Metal Slime! He is slightly smaller and is made with fewer polygons than the others. 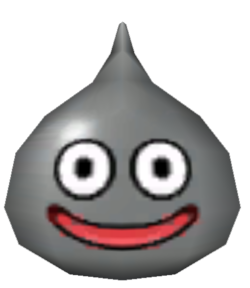 Also, though not unused in the game itself, the archive for the racing minigame includes a model for the regular, playable slime that is separate from the normal character models. More gems buried in the localization files. you get a Bowser card. Right after Memory Block's rules text (entry 3497 in the localization file) is this text. 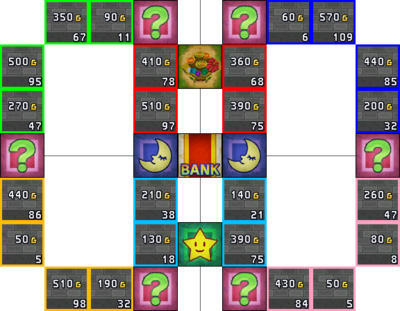 In the final game, you can only choose one block and the game ends immediately afterward. That's the end of your Memory Block. Hope you remember it always! Just after the rest of the Memory Block text (entries 3503 and 3504 in the localization file) is further unused text. Along with these lines of text, the text for picking a Bowser card in Memory Block - unlike all the other cards - does not actually specify what it does, hinting that Memory Block may not have been finished before release. You'll have to part with a shop you own in order to make this investment. OK? Entry 2828 in the localization file. The investment screen does not allow you to invest more than your total stocks + ready cash, so this message goes unused. Look at these files from other versions of the game. The root folder has three .txt files. buildtime.txt contains, as you'd expect, a build date. revision.txt and tmp.txt say the same thing, evidently a revision number. This page was last modified on 27 July 2018, at 21:41.